Excellent reflection. Looks like an impressionist painting upside down. Big vote. Wonderfully seen and composed, V ! This is absolutely stunning!!! excellent colors and amazing reflections!!! Vibrant colors in wonderful composition. Splendid image and color contrasts! Fabulous shot ! Very well done. Fantastic shot, very much like an impressionist painting, love it. BV. You have a keen and tasteful eye. "Sunset Hunter"
Excellent reflection shot. Lovely colors and lighting. "V"
Color, shapes, bright color, life, I lo your pictures, Paolo. Beautiful reflection shot. Great colors and light. "V"
Stunning image. Beautiful band with red and yellow triangles, in a feathered blue water gradient. 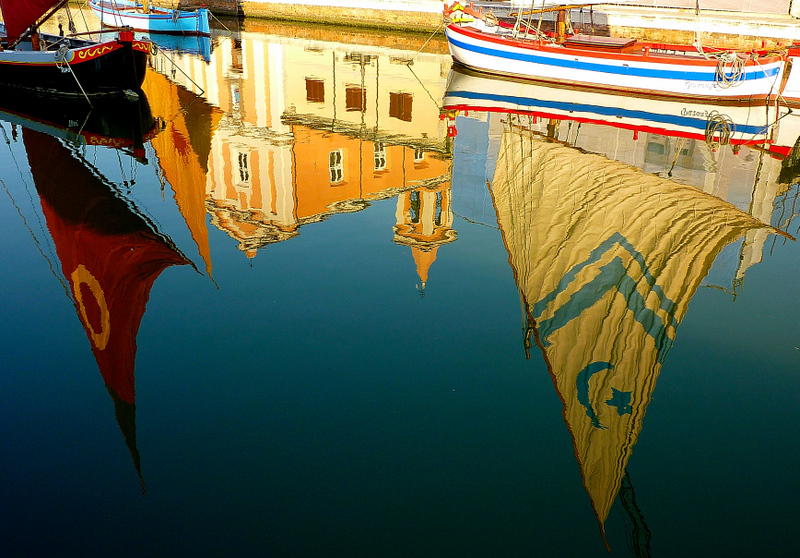 My favorite, nice crop, showing just the a boat and reflections of them and buildings. Not too busy. Great colors as always. Beautiful colors in these reflections! My favorite in this series so far. Wonderful image, Paolo, my big vote! Super! Love the lively colors and composition. V.